Conventional & Analogue Addressable systems fitted to BS5839 part1 2013. Interlinkable mains/battery detectors fitted to BS5839 part 6 2011. These are often required in rented accommodation & flats and houses of multiple occupation (HMOs). 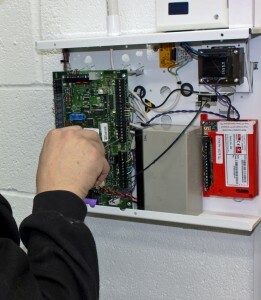 Door retainers, roller shutter doors and ventilation systems, keypad & other door entry systems can be fitted and linked to the fire alarm system to ensure proper function in the event of a fire. Rotating beacons can be fitted where background noise is high or to ensure compliance with Disability Discrimination Act, alerting the hard of hearing. Modification & repair of existing systems to bring them up to current standards. Maintenance & servicing with certification carried out to our own high standard & other installations when necessary with 24/7 cover for emergencies. 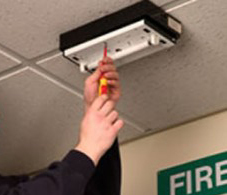 All work carried out to BS5839 2013 (Fire Alarms), BS5266 2011 (Emergency Lighting). Free site visits to assess and quote for all work. Commissioning and maintenance of installations carried out by others. Servicing the whole of a East Anglia. Offering national coverage for the whole of the UK working with fellow members of the British Fire Consortium. Standard Bulkhead units for economy. LED units which offer efficiency and low maintenance. Illuminated “Fire Exit” signs for exits. Twin Spot high intensity units to illuminate large industrial areas. Contact Ace Fire for a quotation.